Thank you We Fancy Books for hosting this blog tour! I hope yous are enjoying it. ~Why should people read Overprotected? One comment I hear over and over again about Overprotected is, "It's way more than I thought it would be!" It's not a girly romance with cliche characters who do the cliche thing. It's a troubling love triangle between an obsessive father, his sheltered princess daughter and the man who comes between them. It's about people ripped apart by their own choices and triumphing over self. ~Where do you get your inspiration from? For Overprotected I drew from my own experiences as an only child, and from my cousin ( also an only child ) who lived the princessesq lifestyle in New York City. ~Which of your books has been your most tresurable to write? The Heavenly series. The series is really the story of my family coping with living with autism and teenage substance and behavior abuse issues. ~Through all the characters in your books which one would you say you relate yourself to most? I'm in all of my characters in one degree or another. My emotional feelings about my children and their choices is probably most defined in Heavenly through Zoe's mother: Debbie. 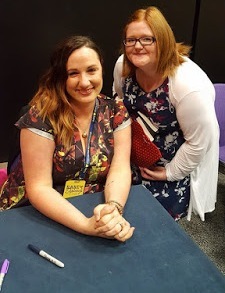 ~Without a doubt your my favourite YA author! Who's yous and why? Markus Zusak. He writes beautifully. ~Do you have any advice for aspiring authors? Read across all genres. Make writing a priority and join a good critique group. ~Are you currently working on anything new atm? If yes could you tell us abit about it? Actually,I first wrote Overprotected in another genre and the story went a different direction. I'd love to incorporate that direction into a book 2. We'll see where the muse takes me after I finish my current WIP. Night Owl or Early Bird? Early bird! Film? Oh my...sooo many...Beastly at the moment. A big Thanks to We Fancy Books & Jennifer Laurens. Have you read Overprotected? What did you think? I feel like i learnt something in this interview! i hope there is a bk2. Thank you for the great interview love following blog tours!